In our previous post, we talked about how to tell if your horse is prone to laminitis, a condition that affects the tissue connecting their legs to their hooves. Unfortunately, there isn’t just two ways that a horse can develop this debilitating condition, so here are more signs that they could be suffering from it. Your horse is insulin resistant – When humans suffer from unstable levels of insulin in their body, they are often suffering from what in humans would be considered diabetes. Keep in mind, however, that horses would very, very rarely contract diabetes. If they do, it could be caused by pancreatic disease or by tumors in the pituitary gland. However when a horse is suffering from extreme highs and lows in their insulin, they could be insulin resistant – which means their body is not responding to the hormone as it should. These severe imbalances in hormone regulation can affect a horse’s weight, which can speed up any process of developing laminitis. 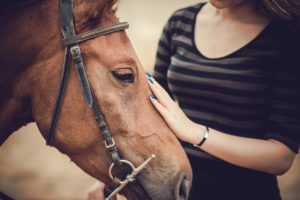 The horse has a hard, thick cresty neck – If your horse has had a change in its neck, specifically a growth of hard fatty tissue along the upper neck, they could be suffering from Cushings Disease. Many times this appears in horses that are obese; however, it can also be seen in horses that are kept thinner due to this condition. These horses often founder in early summer when eating lush pasture grasses. In many studies, scientists have determined that a cresty neck is almost always related to higher insulin levels and weight gain in a horse, thus putting them at risk for laminitis related to founder. Each time a horse founders, it seems that damage is cumulative and changes can be seen in the structure of the hooves. So it is best to restrict a Cushings horse’s diet in spring and summer to avoid founder. If a horse shows signs of stiffness in both front legs, assume it is founder and restrict their diet immediately by reducing or eliminating grain immediately and giving them dry hay to eat and plenty of water. A farrier may need to trim the horse frequently to deal with the changes to the hoof. There are some supplements that can help. But, often keeping the horse’s weight in check, not feeding grain or just a very small amount, and restricting how much lush grass they eat, will keep them from getting laminitis due to founder. Note that it is best not to let any horse prone to bouts of laminitis become overweight, as the weight adds to the stress on the legs and hooves. Other Chronic Laminitis Conditions – As horses age, they may be more prone to the pain of arthritis, and pain will flare up in legs, shoulders or hips and require temporary or continuous pain medication to keep them functioning and rideable. Navicular syndrome is another chronic soundness issue, in which inflammation or degeneration of the navicular bone in the hoof and surrounding tissue can lead to disabling lameness. A farrier or vet will test the horse’s hoof for tenderness. Temporary lameness – Temporary lameness conditions are generally caused by an injury, stone bruise, abscess, pulled muscle or tendon, or shin splint. Also, their hooves can sometimes be cut too short or or wear too short, and this will cause pain till the hoof grows out. If not obvious, sometimes a laceration or loss of hair on the legs or body will help determine the location of the pain. You may be able to isolate where the pain is located by feeling the horse’s legs, hooves, shoulder or hip for heat, and also look for swelling. What to do – The horse owner will need to work with a veterinarian, equine chiropractor and / or farrier to evaluate a lameness condition and determine the best remedy. Each of these professionals may recommend a different ways of evaluating and treating the condition. If you’re looking for livestock mortality insurance to help to protect you and your family, turn to the professionals at Ark Agency today. Contact us here or give us a call at (800) 328-8894 for more information.